THE X FACTOR: L-R: Britney Spears, Simon Cowell, Demi Lovato and L.A. Reid. CR: Nino Munoz / FOX. HOLLYWOOD—At the finale of the ninth season of “American Idol” in 2010, its supercilious judge Simon Cowell bid the franchise farewell, in order to import another of his success shows to America, “The X Factor,” which premiered last year to less than stellar ratings. With the promise of a $5 million recording contract, contestants were chosen from four categories: boys, girls, individuals over 30-years-old and groups. The original judging panel consisted of Simon Cowell, Cheryl Cole, Paula Abdul and L.A. Reid. Cole was soon replaced by Nicole Scherzinger, who initiated the show’s most disturbing moment, when she seemed incapable of making a decision between two contestants, resulting in the audience dismissing 13-year-old Rachel Crow, who had a total meltdown. 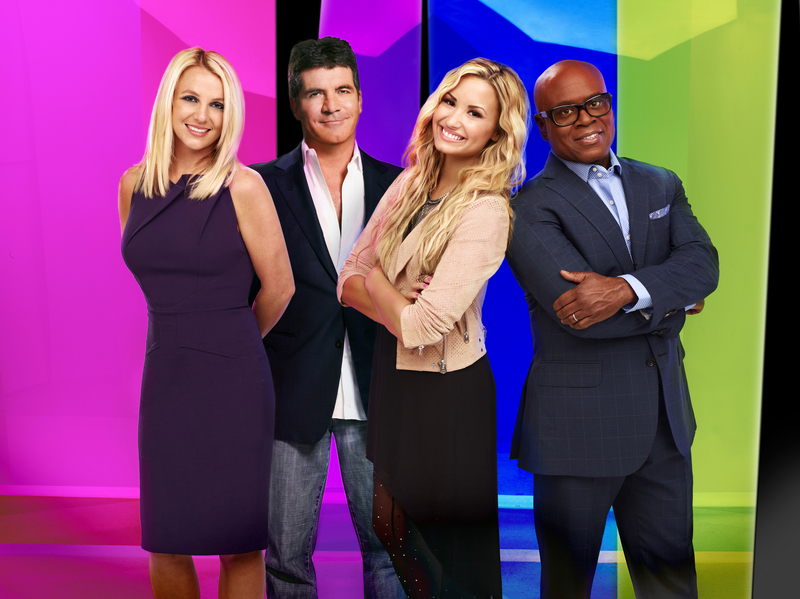 Regrouping for Season 2, Cowell has brought in two new judges to join him and L.A. Reid‑Britney Spears and Demi Lovato. The series premieres Wednesday, September 12 on Fox. Simon spoke of the upcoming season at the TV Critics Association tour. Q: What is it that Britney and Demi bring to the show this season? Cowell: Both bring different things. The No. 1 person I wanted on one of these shows was Britney, because I was fascinated with her as a person. There’s something intriguing about her. I thought it would be interesting to have her on so you see another side of her, and she’s a really good judge. Britney’s quite mean, which you’ll discover. Cowell: Demi is a brat, but there’s something really likeable about her as well. I think the show, because it has such a young audience, needed someone younger, because I’m in my 30s. (He laughs) (We wanted) someone a bit younger (for) the people who watch it. That’s what they both bring, and it has worked brilliantly. Q: You just mentioned that Demi was a brat. The last person you described as a brat isn’t on the show anymore, so how much job security do the judges on your series have? Cowell: Not much. No one has any job security really anymore, including myself. You’re in the hands of the audience who watch the shows. We’ve always made a point on these shows of changing them whenever we think it’s necessary, and even though the girls did a great job last year, we needed a change. We were learning as we went along last year, but I don’t envision this changing for a while. We all seem to be getting along really well. The panel works. The girls seem happy. I’ve got my buddy L.A. back, so we’re having a good time. Q: Who are you agreeing with more often, Britney or Demi? Cowell: They are harder to please than me or L.A. They’re very happy (telling) people ‘no.’ They’ve definitely got their own opinions. But that’s why we hired them. So I have to, unfortunately, agree with them some of the time. Q: Did you ever consider raising the age limit for the contestants after Rachel Crow had that meltdown? Cowell: Not really. The whole point of the show is that you do have an opportunity to save people like Rachel. Unfortunately, it didn’t work that week. But I don’t think that will happen again. And Rachel grew up on the back of it. She’s having a great time. She’s done a lot of incredible things since leaving the show, so there are no scars. We are careful, though, who we screen at that age. Q: Do you feel pressured to find a blockbuster artist? Cowell: The answer to your question is yes I do feel pressured. I put myself under pressure. We all do. If I was making a show and I didn’t believe that we could find a worldwide-selling artist at the end of it, genuinely, I wouldn’t bother making this. I brought the show to America because I think the best singers in the world historically are American. Q: It was announced the Mariah Carey is now a judge on “American Idol.” Can you comment on that? Cowell: I’m happy for her, actually. I like Mariah. I think she’s going to find it difficult to say no. Cowell: You’ve got to say no to people. She’s sweet. I think she’ll be great. I’m happy for her. Q: I’ve heard the complaint that the judges on shows like “American Idol” and “The X Factor” are more important than the talent. Do you feel that’s true? Cowell: When I’m doing my negotiations, yes. (He laughs.) Once it’s signed, then we go back to the contestants. The truth is, it genuinely depends who you get. If you get a Carrie Underwood, then it obviously becomes about the contestants. Melanie Amaro was an amazing winner last year (of “The X Factor”), and I’ve just heard her first single. It’s sensational.